Now a day, trading is being done in different ways and it is not a difficult job to find a lot of people are involved in the business of trading around the globe. In many cases, it becomes difficult for parties to come to know about the accurate information and details of the buyer and seller. In such situations where the complete information is not available, it is really hard to believe the words of the buyer and just ship the required products at the given address of the buyer. Therefore, it is deemed necessary to make some arrangements to make it sure that the shipment is going on as per the requirements mentioned by the buyer or customer. To find all these relevant information required for doing a trustworthy trading transaction, a freight invoice is required. The reason of using this invoice is that a number of required details are included in this regarding the traded price of the product, location of the buyer and signing of the business agreement. Freight invoice is of great help when the products are shipped to intermediate places. 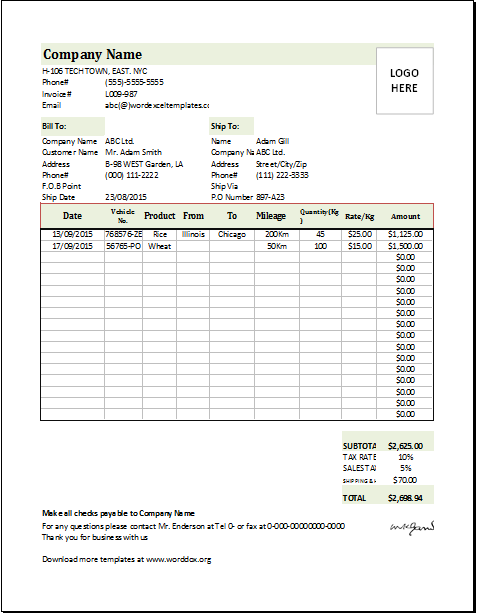 This invoice is a common MS EXCEL invoice template that is normally used in both international as well as domestic trade, the wherein currency has to be defined, additional details of shipping are required, and also details about the customers are required. The given freight invoice template is having a similarity with a sales quote because of its use to define the trade value before completion of sales or shipping.